Spring is here, it's when the flowers start blooming and the concerts start playing! Uptown’s Spring Friday Night Concert Series will be in full swing on April 6. Columbus, Georgia is putting its best foot forward with nature’s beauty along the Chattahoochee. Beautiful gardens, nice evening walks, great food, music, art, and so much more. One of the best kept secrets in the Deep South is a weekend in the classic Southern city of Columbus where old, new, and adventure all merge together. Come for Uptown’s Spring Friday Night Concert Series with one great act after another guaranteeing that every weekend in the Spring will be full of great music, fun, and a chance to hang out with friends old and new. 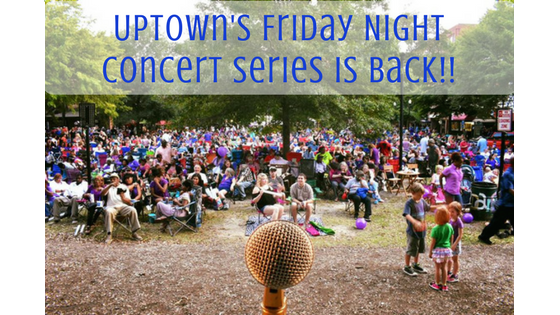 Uptowns' Spring Friday Night Concert Series is BACK! Starting April 6 there will be a concert every Friday night kicking off at 7:30 pm lasting until 10 pm. All concerts are FREE and open to all ages. Bring your lawn chair, blanket, pets and family for a night of great music and fun! With great music being a fantastic way to kick off a weekend, we have more going on that will make staying over an absolute must. Soon, we’ll be talking about Paddle South, the Freestyle Kayaking Nationals April 14-15 and all of the events surrounding this incredible event. Whether you want to enjoy a great dinner and a show, an evening of music, a day of art and museums, outdoor fun with whitewater rafting and kayaking, or a hundred other adventures, Columbus, Georgia is the perfect Spring weekend destination! Take advantage of the beautiful weather and come spend time in Uptown Columbus! The lineup for concerts is listed below. CB&T Deck, Corner of 11th Street & Front Ave.